In 2011, Neil Boothby was asked by the Education Above All Foundation to prepare a Global Monitoring System Feasibility Study in relation to attacks on education in times of insecurity and conflict. This study recommended a continuation of the broad collection of data through the Education under Attack series of publications, together with in-depth studies of attacks and responses in selected countries facing this problem. 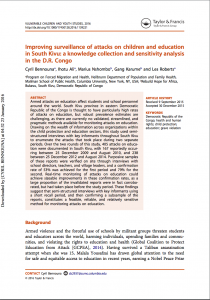 Research is now underway in the DRC and Somalia to examine various methodologies used to monitor attacks on education in these conflict affected countries, measures to protect schools and their personnel, and ways to increase national capacity to monitor this violation of attacks on schools. The research also seeks to identify roles played by different stakeholders, including the ministries of Education, Justice, Defense, Social and Interior Affairs; UN actors including the Education and Protection Clusters, Child Protection sub-cluster; the UN CTFMR; civil society organizations and community-based organizations.